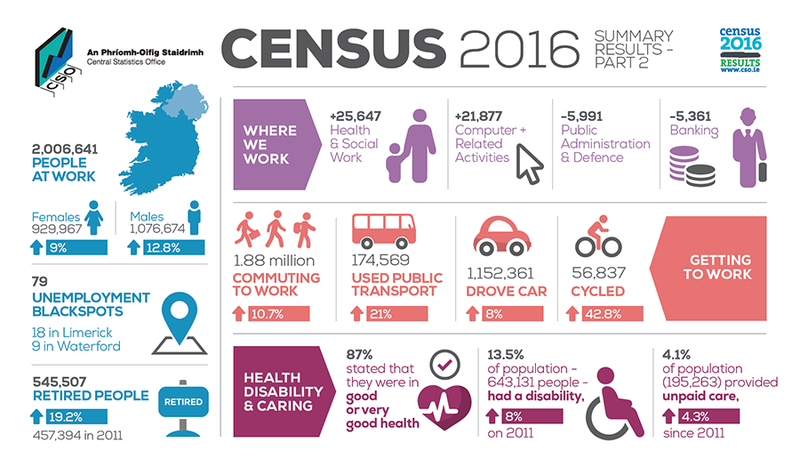 The CSO has just issued the second set of summary results from Census 2016. ‘Census 2016 Summary Results – Part 2’ gives initial results of some of the socio-economic indicators from Census 2016. More detailed results for each theme will be released in ‘Profiles’ between now and December. This initial blog post will examine the Principal Economic Status results and other themes will be analysed in future posts. What is Principal Economic Status? Principal Economic Status (PES) measures the economic status e.g. at work, retired, student etc. of the entire population aged 15 years and over. It is a self-assigned measure in that the person selects the category they believe applies to them. It differs from the ILO definition that is used in the Quarterly National Household Survey (QNHS) and the official employment figures. This difference mainly impacts on the numbers counted as in employment – for the ILO definition, if a person has worked for payment or profit for 1 hour or more in the previous fortnight they are counted as employed. This will result in a higher number being counted as employed than when people are asked to give their own status as in the PES question in the Census. Therefore the PES data from the Census will not match the official employment statistics for that period. For more see the Appendices to the report. In the Western Region in 2016 there 653,749 persons aged over 15 years. Fig. 1 shows their economic status. Just over half (51.1%) the region’s adult population stated that they were ‘at work’ (employed or self-employed) (Fig. 2). This was an increase from 2011 when 48.2% of the region’s adult population was working. Since 2011 there has been a notable decline in the share of the population unemployed (having lost or given up a job) from 11.2% down to 7.4%. The other category showing considerable change is the number who are retired, rising from 14% up to 16.6%. This is in line with a national trend of an increasing number of retired people, partly driven by rising life expectancy, recent early retirement schemes in the public sector and also the fact that the historical trend of rising female labour force participation is now leading to increasing numbers of women in retirement. Women who are engaged in home duties tend to continue to report themselves as such, even into their older years, whereas women who have participated in the labour force would report themselves as retired when they retire from paid employment. The downward trend in the number of people engaged in home duties continued in this Census, declining from 9.4% to 8% in the region. There was a slight decline in the share of the population unable to work due to illness or disability (4.6% to 4.4%), while the share of the population (15+ yrs) who are students was exactly the same in 2016 as in 2011, though of course the actual number of students would have changed (it increased by 1.5%). The PES composition of the adult male and female population in the Western Region is shown in Fig. 3. One of the most notable gender differences is in the share of males and females who are ‘at work’, 55.3% compared with 47%. The trend in the share of women at work has been increasing over time due to rising female labour force participation, however there continues to be a lower share of adult women at work. Between 2011 and 2016 the number of males at work in the Western Region increased by 8.4% while the number of females only rose by 6.5%. Though it must be taken into account that the decline in the number of males at work during the previous intercensal period was far higher. There is a lower share of women who are unemployed, both having lost a job (5.9% v 9%) and first time jobseekers (0.7% v 0.9%). As noted above, the ongoing increase in female labour force participation has led to a rising share of women who are retired. The share of all women who are retired (16.1%) is now closer to men (17.1%). 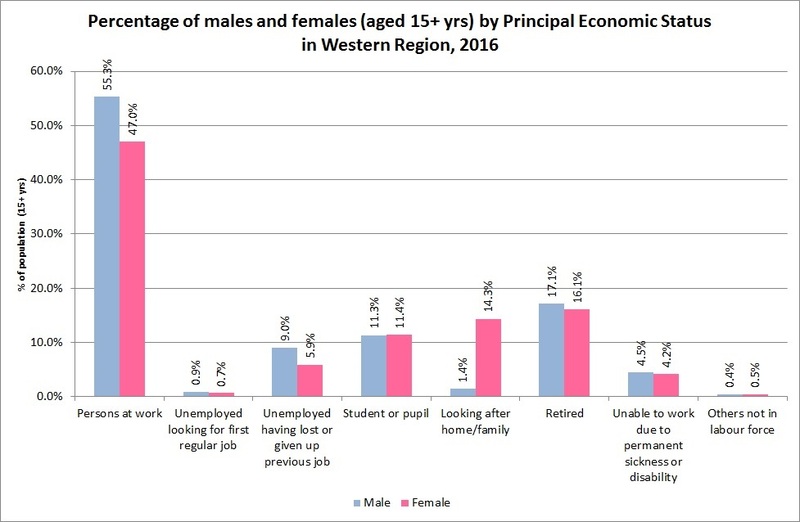 Since 2011 there has been a 16.9% increase in the number of retired men in the Western Region but a 23.3% increase in the number of retired women, both increases are quite close to what happened nationally over that period. 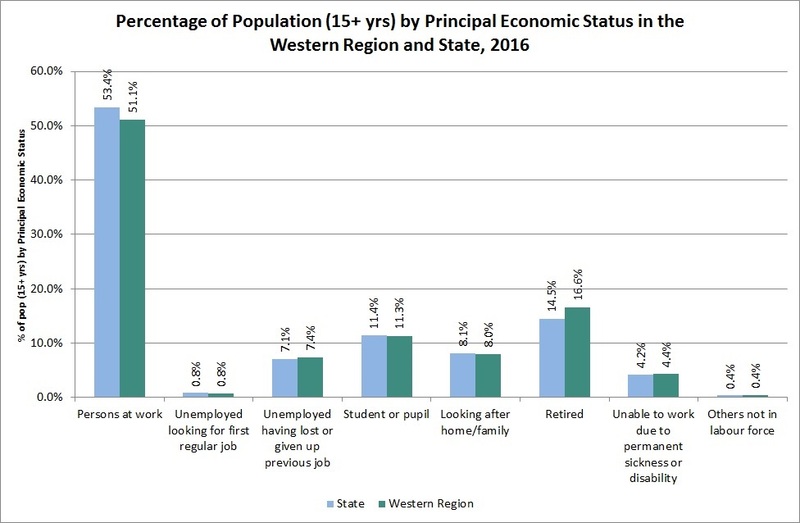 Comparing the PES of the adult population of the Western Region with the State average (Fig. 4), the main difference is in the share ‘at work’. At 53.4%, the State is higher than the Western Region (51.1%). The other category where there is a notable difference is retired. In the region, 16.6% of adults are retired, compared with 14.5% in the State. This would be linked to the region’s older age profile. 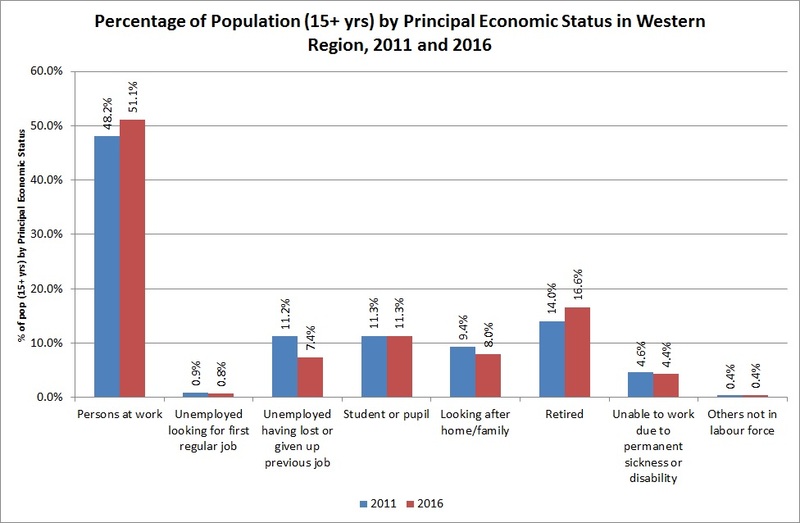 The region also has a slightly higher share of its population unemployed having lost/given up a job and those unable to work due to illness/disability. Details on the economic status of the population by town size is also available. The detailed information for individual towns will be released in future Profiles, but the Summary Results provide details for the five cities (with their suburbs), and then various town size categories and rural areas. From Table 1 it can be seen that Dublin city and suburbs has the highest share of its population at work (56.1%) while Limerick city has the lowest (47.2%). Among the five cities, Galway has the second highest share (53.5%). There is a general pattern that the share of the population at work declines from the larger towns of 10,000+ (53.1%) down to the smaller towns, and then villages (49.4%). It must of course be remembered that these size categories would include towns within the hinterlands of the cities which function as commuter towns. The open countryside (beyond areas of 50 inhabited houses) has a high share of its population at work. This is likely linked to both farming and commuters living in rural houses. 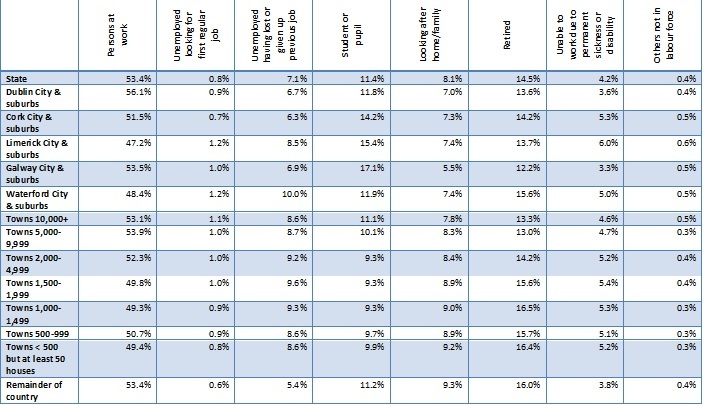 In terms of unemployment, Cork, Dublin and Galway have the smallest shares of their population unemployed (having lost/left a job), at under 7%, compared with 10% in Waterford. Among towns, the share who are unemployed generally increases as town size declines, though villages and open countryside have lower shares unemployed. This is partly explained by the higher share of retired people. Towns of 1,000-1,499, followed by villages and open countryside, have the highest shares of their population retired at over 16%. Galway on the other hand has the lowest share of retired among its population (12.2%). This is mirrored by Galway also having the highest share of students (17.1%), which strongly shows the influence of both NUIG and GMIT on the city. Limerick and Cork have the next highest shares of students again highlighting the importance of their higher education institutions. The category of towns of 10,000+ would include those which have an Institute of Technology e.g. Sligo, Dundalk, so it does show a higher share than smaller towns but still considerably less than in the cities. When the details for individual towns are released it will be easier to see the impact of individual IoTs. The share of the population looking after home/family has a quite strong pattern, increasing steadily as town size declines from 10,000+ (8.3%) to open countryside (9.3%). The share in all cities is below 7.5% and in Galway, again reflecting its young age profile, the share is only 5.5%. A quite similar pattern can be seen for those unable to work due to illness or disability, which generally increases as town size declines though falls again for villages and open countryside, where it is particularly low. This may be linked to accessibility issues as those with a disability and their families may choose to live in a town or city for easier access to services. The highest rate in the country is in Limerick city, with Galway having the lowest. This initial look at the PES data from Census 2016 confirms the general trend of improving labour market conditions, with an increase in the share of the adult population who are working and a fall in unemployment. Increasing life expectancy and the consequence of increasing female labour force participation has also led to a strong growth in the retired population, a trend with clear policy implications. While there continue to be significant gender differences in terms of economic status, the difference is reducing, though a substantially higher share of women than men are still engaged in home duties. Compared with the national picture, the region has a lower share at work and higher share who are retired, partly linked to the region’s age profile and weaker labour market. 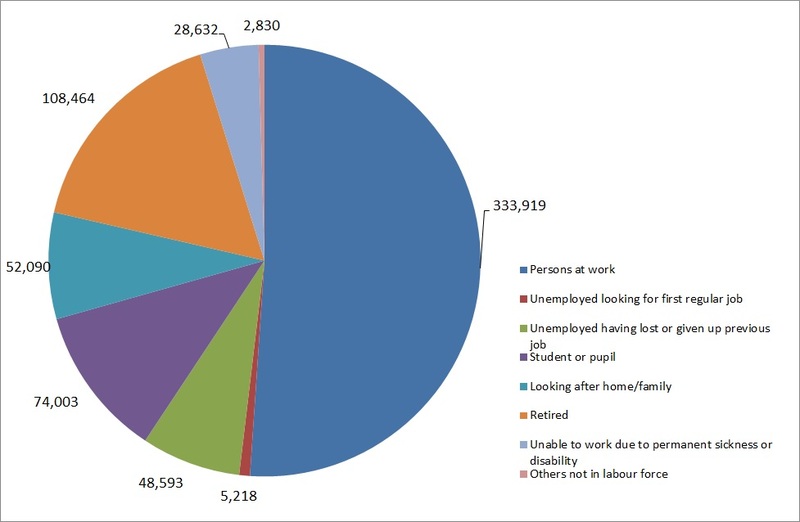 Future blog posts will examine in detail the Census data on the region’s labour market (labour force participation, employment, industries, occupations and unemployment), to examine what has occurred within the ‘at work’ and ‘unemployed’ groups. This entry was posted in Regional Statistics and tagged Census 2016, CSO data, Data, labour market, Principal Economic Status, Western Region. Bookmark the permalink.